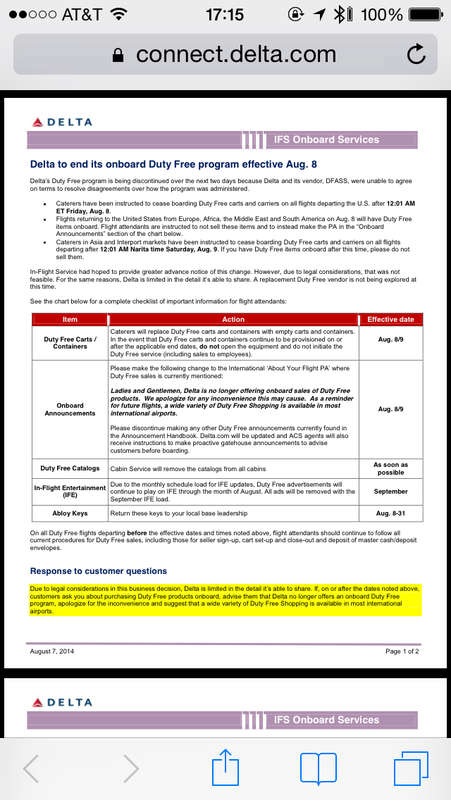 Delta Air Lines is ceasing duty free sales on international flights today, citing disagreement with its duty free vendor, DFASS. In an internal message to flight attendants, obtained by RGN, Delta’s inflight service unit said, “The decision to end the program came after Delta and its duty free vendor, DFASS, were unable to agree on terms to resolve disagreements over how the program would be administered. Duty free is only offered on Delta’s long-haul international (not Caribbean) and Asia flights. Alcoholic beverages and headsets are complimentary in all cabins. Some Delta flight attendants find duty free sales to be an annoyance more than anything else. The commission received by flight attendants for selling duty free items is minimal, and there is fraud in some markets. Delta frequent flyer Rebekah Michaels is celebrating the decision, saying she’s excited at the prospect of not hearing another announcement on board after the meal service “especially on the overnight flights”. Considering the worldwide sunset date of 8 August, and the checklist provided to flight attendants today (see below), it seems that this decision was well-thought-out by management. Delta could not provide immediate comment about the impact of its decision on revenues, and the expected fuel savings associated with removing duty free trolleys. However, RGN can reveal that, based on Delta’s records from October 2012 to September 2013, the duty free commission amount paid by DFASS during that period averaged to be approximately $10 per month per flight attendant, with 65% of flight attendants earning less than $100 per year in commission. These meagre sums suggest that Delta was not moving a significant volume of duty free goods. Also interesting is the fact that Delta’s arrangement with DFASS is structured so that DFASS owns the individual flight attendant commission data, and Delta does not have access to current data. Should Delta ultimately opt to create a virtual shopping experience for passengers – via its inflight Wi-Fi portal, for instance, or through an app – the carrier could tailor the service to fit its needs and own the data. The carrier has not given any indication that this approach is in the cards, through Delta’s inflight connectivity partner, Gogo, recently revealed that the carrier’s new streaming video plan has broader implications for customer relationship management. Great for me as a passenger and if I were a flight attendant I would love dumping this hassle if the commissions are as low as reported. The Delta flyers I most regularly see purchasing duty-free are very high maintenance with limited English and lots of demands to inspect products that often balloons into a prolonged disturbance with multiple flight attendants assisting and multiple passengers debating the purchases. Delta, well NWA, always made a big deal out of Japan home delivery, so I wonder if their Japan business was strong, but then again, Delta management seems to have been determined since the merger and failed woo-ing of JAL to abandon NWA’s once great Japan business. For some time now the consumer has been moving online to search for duty free goods in advance of their trip, we see evidence of these searches daily. The traveller also seeks pre-order and convenient delivery, because he has become his own advance-online trip planning agent and it has become second nature to organise everything in advance. The duty free retail model has always been “captive”, be it on-board or in the airport through dwell time or walk-thru stores. Airlines also need in-flight sales assistants, which many don’t provide. 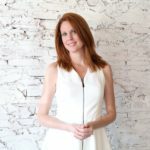 At some point, a large proportion of this business will become an online pre-order retail business, which is what many consumers now want. This has been precipitated by the airlines’ demanding online reservation and check-in and the sale/organisation of ancillaries. This makes it natural for the consumer to arrange everything in advance.